1172 Springburn Road, Springburn, Glasgow. G21. Situated on Springburn Road and built on a site on which running water was found during the excavations, the public house was named with this in mind the Spring Inn. The licence holder Desmond Owen Bradley who formerly owned premises in Kingston Street the licence for which at one time was held by his father John F Bradley, opened the Spring Inn in 1961. The opening ceremony was conducted by Mr J A MacDonald of West of Scotland manager for Scottish & Newcastle Breweries, who congratulated Mr Bradley on on the delightful public bar, the luxurious lounge and the handsome off-sales department. The entire premises, he said, provided an outstanding example of what could be achieved by private enterprise. Skilful use of sapelle and mahogany in the lounge, where the bar itself, semi-circular in shape, is topped in cherry plastic wood. Japanese oak was used in the public bar. Electrical underfloor heating was installed throughout the premises, a new burglar alarm system was also installed at the time, something this pub definitely needed. The manager of the bar was then Mr E McLaughlin. The Spring Inn had a reputation of being a stab Inn, it was a magnet for hooligans and was finally closed down in the 1990s, it is used now as a tool hire establishment. 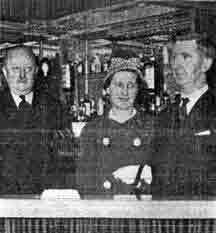 Left to right Mr J A MacDonald, Glasgow and West of Scotland manager of Scottish Brewers Ltd, Mrs Bradley and Desmond Owen Bradley. 1961. Left to right Mr D Bradley, Mrs Bradley, Mrs Ramster, George Ramster, Mrs E Smyth, Mr Edward Smyth, Mrs McGrath, Bailie G McGrath, Mrs Flynn and Mr J Flynn. Group of personalities attending the annul dinner dance of the Glasgow Vintners in the Bellahouston Hotel, Glasgow. 1973. 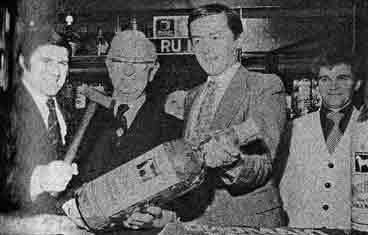 Bertie Auld, Partick Thistle manager, holding hammer, is all set to crack open a White Horse gallon bottle (containing more than £100 for charity, in the Spring Inn, Springburn. In the centre is the the pub owner, Des Owen Bradley, who, besides being president of the Glasgow Vintners, is a member of the Scottish Taverners, some 40 pubs, hotel and restaurants owners competing in raising cash for charity organisations in Scotland. Holding the bottle is John Young, White Horse. 1979. 1991 Elizabeth Ralston for Bass Inns.